The 19th and early 20th century saw considerable organizing for temperance or prohibition. Temperance usually refers to seeking to inspire individuals to moderate liquor use or abstain from drinking liquor. Prohibition usually refers to making it illegal to manufacture or sell alcohol. The effects of drunkenness on families―in a society in which women had limited rights to divorce or custody, or even to control their own earnings―and the growing evidence of medical effects of alcohol, prompted efforts to convince individuals to "take the pledge" to abstain from alcohol, and then to persuade states, localities and eventually the nation to prohibit the manufacture and sale of alcohol. Some religious groups, notably the Methodists, believed that drinking liquor was sinful. By the early 20th century, the liquor industry, like other industries, had extended its control. In many cities, saloons and taverns were controlled or owned by liquor companies. The growing presence of women in the political sphere was accompanied by and reinforced by the belief that women had a special role in preserving families and health and thus to work to end liquor consumption, manufacture and sale. 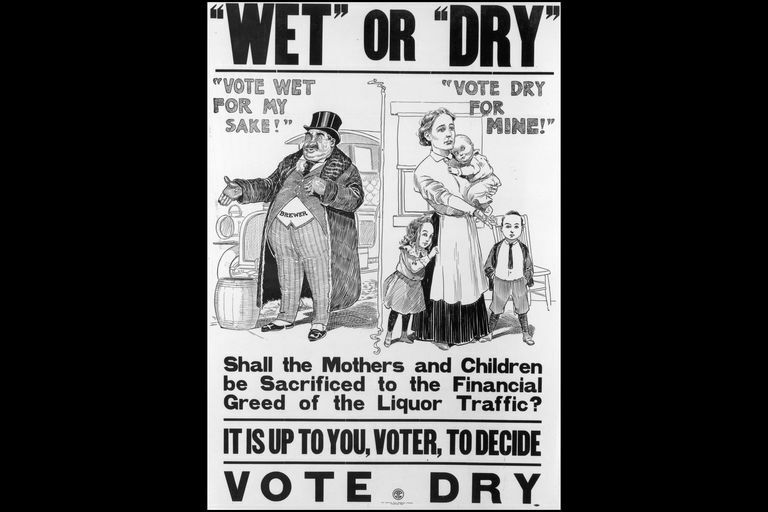 The Progressive movement often took the side of temperance and prohibition. In 1918 and 1919, the federal government passed the 18th Amendment to the U.S. Constitution, making manufacture, transportation, and sale of "intoxicating liquors" illegal under its power to regulate interstate commerce. The proposal became the Eighteenth Amendment in 1919 and took effect in 1920. It was the First Amendment to include a time limit for ratification, though it was quickly ratified by 46 of the 48 states. It was soon clear that criminalizing liquor had increased the power of organized crime and the corruption of law enforcement, and that consumption of liquor continued. By the early 1930s, public sentiment was on the side of decriminalizing the liquor industry, and in 1933, the 21st Amendment overturned the 18th and prohibition ended. Some states continued to permit a local option for prohibition or to control liquor statewide. The following timeline shows the chronology of some of the major events in the movement to convince individuals to abstain from liquor and the movement to prohibit commerce in liquor. 1773 John Wesley, the founder of Methodism, preached that drinking alcohol was sinful. 1813 Connecticut Society for the Reformation of Morals founded. 1813 Massachusetts Society for the Suppression of Intemperance founded. 1820s The consumption of alcohol in the U.S. was 7 gallons per capita per year. 1826 Boston area ministers founded the American Temperance Society (ATS). 1831 American Temperance Society had 2,220 local chapters and 170,000 members. 1833 American Temperance Union (ATU) founded, merging two existing national temperance organizations. 1834 American Temperance Society had 5,000 local chapters and 1 million members. 1838 Massachusetts prohibited the sale of alcohol in amounts less than 15 gallons. 1839 September 28: Frances Willard born. 1840 Consumption of alcohol in the U.S. had been lowered to 3 gallons of alcohol per year per capita. 1840 Massachusetts repealed its 1838 prohibition law but permitted local option. 1840 Washington Temperance Society founded in Baltimore on April 2, named for the first U.S. president. Its members were reformed heavy drinkers from the working class who "took the pledge" to abstain from alcohol, and the movement to establish local Washington Temperance Societies was called the Washingtonian movement. 1842 John B. Gough "took the pledge" and began lecturing against drinking, becoming a major orator for the movement. 1842 Washington Society publicized that they had inspired 600,000 abstinence pledges. 1843 Washington Societies had mostly disappeared. 1845 Maine passed statewide prohibition; other states followed with what were called "Maine laws." 1845 In Massachusetts, under the 1840 local option law, 100 towns had local prohibition laws. 1846 November 25: Carrie Nation (or Carry) born in Kentucky: future prohibition activist whose method was vandalism. 1850 Consumption of alcohol in the U.S. had been lowered to 2 gallons of alcohol per year per capita. 1851 Maine prohibited the sale or making of any alcoholic beverage. 1855 13 of the 40 states had prohibition laws. 1867 Carrie (or Carry) Amelia Moore married Dr. Charles Gloyd; he died in 1869 of the effects of alcoholism. Her second marriage was in 1874, to David A. Nation, a minister, and attorney. 1869 National Prohibition Party founded. 1873 December 23: Women&apos;s Christian Temperance Union (WCTU) organized. 1874 Women&apos;s Christian Temperance Union (WCTU) officially founded at its Cleveland national convention. Annie Wittenmyer elected president and advocated focusing on the single issue of prohibition. 1876 World&apos;s Women&apos;s Christian Temperance Union founded. 1879 Frances Willard became president of the WCTU. She led the organization in being active in working for a living wage, the 8-hour day, women&apos;s suffrage, peace, and other issues. 1881 WCTU membership was 22,800. 1884 National Prohibition Party nominated John P. St. John (Kansas) for President; he received 147,520 votes. 1888 The Supreme Court struck down state prohibition laws if they forbid the sale of alcohol that was transported into the state in its original passage, on the basis of the federal power to regulate interstate commerce. Thus, hotels and clubs could sell an unopened bottle of liquor, even if the state banned alcohol sales. 1888 Frances Willard elected president of the World&apos;s WCTU. 1888 National Prohibition Party nominated Clinton B. Fisk (New Jersey) for President; he received 249,813 votes. 1889 Carry Nation and her family moved to Kansas, where she began a chapter of the WCTU and began working to enforce the liquor ban in that state. 1891 WCTU membership was 138,377. 1892 National Prohibition Party nominated John Bidwell (California) for President; he received 270,770 votes, the largest any of their candidates ever received. 1896 National Prohibition Party nominated Joshua Levering (Maryland) for President; he received 125,072 votes. In a party fight, Charles Bentley of Nebraska was also nominated; he received 19,363 votes. 1898 February 17: Frances Willard died. Lillian M. N. Stevens succeeded her as president of the WCTU, serving until 1914. 1899 Kansas prohibition advocate, nearly six foot tall Carry Nation, began a 10-year campaign against illegal saloons in Kansas, destroying furniture and liquor containers with an ax while dressed as a Methodist deaconess. She was often jailed; lecture fees and ax sales paid her fines. 1900 National Prohibition Party nominated John G. Woolley (Illinois) for President; he received 209,004 votes. 1901 WCTU membership was 158,477. 1901 WCTU took a position against the playing of golf on Sundays. 1904 National Prohibition Party nominated Silas C. Swallow (Pennsylvania) for President; he received 258,596 votes. 1907 The state constitution of Oklahoma included prohibition. 1908 In Massachusetts, 249 towns and 18 cities banned alcohol. 1908 National Prohibition Party nominated Eugene W. Chapin (Illinois) for President; he received 252,821 votes. 1909 There were more saloons than schools, churches or libraries in the United States: one per 300 citizens. 1911 WCTU membership was 245,299. 1911 Carry Nation, prohibition activist who destroyed saloon property from 1900-1910, died. She was buried in Missouri, where the local WCTU erected a tombstone with the epitaph "She hath done what she could." 1912 National Prohibition Party nominated Eugene W. Chapin (Illinois) for President; he received 207,972 votes. Woodrow Wilson won the election. 1912 Congress passed a law overturning the Supreme Court&apos;s 1888 ruling, permitting states to forbid all alcohol, even in containers that had been sold in interstate commerce. 1914 Anna Adams Gordon became the fourth president of the WCTU, serving until 1925. 1914 The Anti-Saloon League proposed a constitutional amendment to prohibit the sale of alcohol. 1916 Sidney J. Catts elected Florida Governor as a Prohibition Party candidate. 1916 National Prohibition Party nominated J. Frank Hanly (Indiana) for President; he received 221,030 votes. 1917 Wartime prohibition passed. Anti-German feelings transferred to being against beer. Prohibition advocates argued that the liquor industry was an unpatriotic use of resources, especially grain. 1917 Senate and House passed resolutions with the language of the 18th Amendment and sent it to the states for ratification. 1918 The following states ratified the 18th Amendment: Mississippi, Virginia, Kentucky, North Dakota, South Carolina, Maryland, Montana, Texas, Delaware, South Dakota, Massachusetts, Arizona, Georgia, Louisiana, Florida. Connecticut voted against ratification. 1919 January 2 - 16: the following states ratified the 18th Amendment: Michigan, Ohio, Oklahoma, Idaho, Maine, West Virginia, California, Tennessee, Washington, Arkansas, Illinois, Indiana, Kansas, Alabama, Colorado, Iowa, New Hampshire, Oregon, North Carolina, Utah, Nebraska, Missouri, Wyoming. 1919 January 16: 18th Amendment ratified, establishing prohibition as the law of the land. The ratification was certified on January 29. 1919 January 17 - February 25: although the requisite number of states had already ratified the 18th Amendment, the following states also ratified it: Minnesota, Wisconsin, New Mexico, Nevada, New York, Vermont, Pennsylvania. Rhode Island became the second (of two) states to vote against ratification. 1919 Congress passed the Volstead Act over President Woodrow Wilson&apos;s veto, establishing procedures and powers to enforce prohibition under the 18th Amendment. 1920 January: Prohibition Era began. 1920 National Prohibition Party nominated Aaron S. Watkins (Ohio) for President; he received 188,685 votes. 1921 WCTU membership was 344,892. 1922 Although the 18th Amendment had already been ratified, New Jersey added its ratification vote on March 9, becoming the 48th of 48 states to take a position on the Amendment, and the 46th state to vote for ratification. 1924 National Prohibition Party nominated Herman P. Faris (Missouri) for President, and a woman, Marie C. Brehm (California), for Vice President; they received 54,833 votes. 1925 Ella Alexander Boole became president of the WCTU, serving until 1933. 1928 National Prohibition Party nominating William F. Varney (New York) for president, narrowly failing to endorse Herbert Hoover instead. Varney received 20,095 votes. Herbert Hoover ran on the party ticket in California and won 14,394 votes from that party line. 1931 Membership in the WCTU was at its peak, 372,355. 1932 National Prohibition Party nominated William D. Upshaw (Georgia) for President; he received 81,916 votes. 1933 Ida Belle Wise Smith became president of the WCTU, serving until 1944. 1933 21st Amendment passed, repealing the 18th Amendment and prohibition. 1933 December: 21st Amendment took effect, repealing the 18th Amendment and thus prohibition. 1936 National Prohibition Party nominated D. Leigh Colvin (New York) for President; he received 37,667 votes. 1940 National Prohibition Party nominated Roger W. Babson (Massachusetts) for President; he received 58,743 votes. 1941 WCTU membership had fallen to 216,843. 1944 Mamie White Colvin became president of the WCTU, serving until 1953. 1952 National Prohibition Party nominated Stuart Hamblen (California) for President; he received 73,413 votes. The party continued to run candidates in subsequent elections, never gaining as many as 50,000 votes again. 1953 Agnes Dubbs Hays became president of the WCTU, serving until 1959. Teetotaller: What's That Mean and What's Its History?